November 6, 2014 | 4 p.m.
Family and friends of Virgil Olson gathered recently to dedicate stained glass at Bethel Seminary St. Paul. 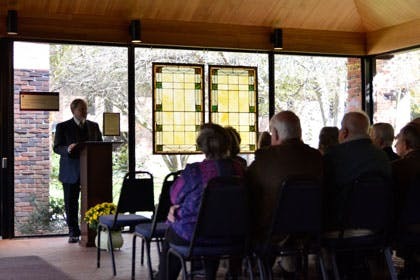 Friends and family of the late Virgil Olson gathered in October at Bethel Seminary St. Paul to dedicate two century-old, stained glass windows that originally hung in the Bethel Seminary chapel on the previous campus. These windows had been in the archives of the History Center – which houses documents significant to Swedish Baptist history, the Baptist General Conference, Converge Worldwide, and Bethel University – for several years and needed restoration. When Olson died in 2013, his family donated funds to the History Center for the cleaning, restoration, and framing of the windows so they could again be displayed and shared with the community. The windows were installed in the rotunda area outside of the seminary chapel so their lovely colors and patterns can again be enjoyed by all who pass by. 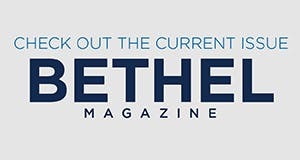 Olson had a deep history with Bethel University, serving in several roles during a long career at both the seminary and the college and with the Baptist General Conference (BGC), now Converge Worldwide. A professor of church history and missions in the seminary for 17 years, he also served as dean of Bethel College and as the director of BGC World Missions. Olson was also a charter member of the Friends of the History Center committee as well as a prolific writer. The windows, which were installed last March, were restored by Alan J. Palmer of Gaytee-Palmer Stained Glass of Minneapolis. Several other original windows from the former Bethel Seminary chapel in St. Paul now hang in the Bethel Seminary San Diego chapel. The dedication was held as part of the biennial meetings of Bethel University, the Minnesota-Iowa Baptist Conference, and Converge Worldwide.